A diamond is forever, but in the history of pearls, Natural Pearls have been recognized as prized jewels, in the History of Jewelry for centuries longer than any cut stone. Rare information on pearls, emphasizes that the warm waters of the Arabian/Persian Gulf was the receptacle for the world’s oldest, largest and the rarest pearl beds ever known. This region, and in particular the Gulf of Mannar, between India and Sri Lanka, was the international center of the Natural Pearl industry for over 4,000 years, with the Arabian Gulf and the Red Sea. The species of pearl oyster known as "Pinctada Radiata" flourished in these waters. Ounce for ounce, Natural pearls are one of the most valuable natural objects on earth, so sought after and expensive that Julius Caesar barred women below a certain rank from even wearing them. Man at his best and man at his worst, inamorata of Natural pearl, appear throughout the pages of pearl history. Kings, and India's princes - The Maharajahs have courted them tirelessly. Many of these cool fames have been gained at a scorching price. "Pearls are like a woman. Once you discover her, you will never stop loving her." Understandably, a trade that's kept its secrets for millennia, does not yield up its wisdom just for the asking. Diving for Natural Pearls in the early pearling days was filled with danger in the history of pearls. In search of the perfect natural pearl, many pearl divers have lost their lives. Torres Straits "skin" divers, for instance, were considered to be the best divers in the world, being able to "stay down" for two or three minutes. The history of the trade has been no rose garden. Today people prefer to use scientific rather than romantic terms to describe them. They talk about a Pearl's "symmetry" rather than its shape, its "surface" rather than complexion. In the history of pearls, the romantic terms to describe pearls are actually more accurate because they are evocative and more precisely describe what you see and feel when looking at Natural Pearls. A careful consideration of the Girl with a Pearl Earring gives rise to the question of how far the painting is to be taken as a portrait. P. T. A. Swillens, who compiled the first exhaustive study of the artist's life and work in 1950, believed that one of the most important characteristics of a 17th-century portrait was its likeness and although we can no longer judge of this anymore, the face would not be called a beauty in an aesthetic sense. 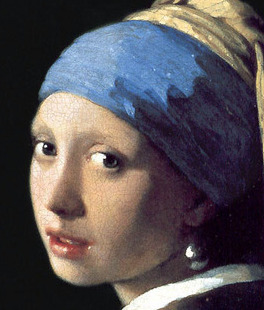 Swillens writes that Vermeer made no attempt to idealize her. Contemporary scholars are not in agreement on the subject. According to Arthur Wheelock the painting is an "idealized study" which reveals Vermeer's "classical tendencies." Not a single sitter in Vermeer's extant paintings has ever been identified, including the young girl in the Girl with a Pearl Earring. Many critics believe that she may have been Vermeer's first daughter, Maria who would have been about 12 or 13 years old in 1665-1667, the dating scholars have assigned to the painting. However, this painting was certainly not a portrait in the 17th-century sense of the term, but rather a tronie. In any case, she resembles the model in Vermeer's Art of Painting. http://www.essentialvermeer.com/catalogue/girl_with_a_pearl_earring.html on January 2nd 2012.